Protect your dog from poisonous Sonoran desert toads. Sonoran desert toads (Bufo alvarius), which are also know as Colorado river toads, are found in parts of the desert Southwest. 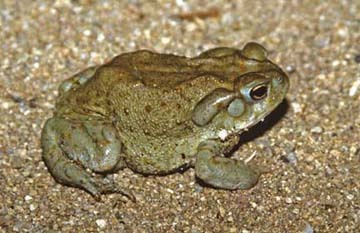 These toads are very common in the Phoenix and Tucson, Arizona areas. They lie dormant, buried in the soil, until the desert monsoon rains of July, August and September soften the ground and allow these large toads to come to the surface in search of insects and mates. The Sonoran desert toad, at a length of 3″ to 7″ the largest native toad in the United States, should not be confused with smaller toad species also found in the desert Southwest which are beneficial species and not a danger to dogs. The distingushing feature on a Sonoran desert toad is the elongated 2 inch parotoid gland located at the rear corner of the toad’s eye and running in a line back to the toad’s shoulder. 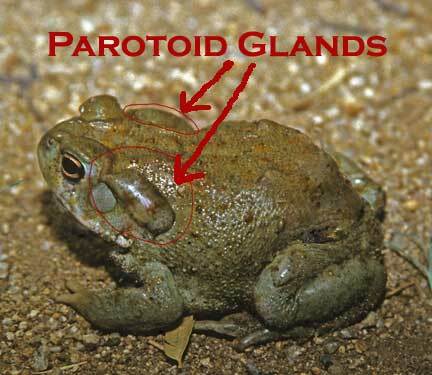 The gland appears as a large welt on the side of the toad’s head and is unique to this species. This gland secretes a poisonous slime. When a dog mouths, licks, eats, or carries a toad in its mouth, the poison comes into contact with the mucus membranes in the dog’s mouth and allows the poison to enter the dog’s body. The poisonous slime coats the interior of the dog’s mouth and takes effect immediately. The dog becomes incoherent and his eyes dilate. Drooling is present from the dog’s mouth. In a matter of minutes, the dog looses muscle control including bladder fuction. This is followed in short order by convulsions. Depending on the severity of the exposure, the convulsions are followed by death. Small dogs in particular often die after exposure to a Sonoran desert toad. The treatment for a toad poisoned dog is to run water from a hose through the dog’s mouth and rub the slime off of the mucus membranes of the dog’s mouth with your fingers. Use the stream of water to flush the poison slime out of the dog’s mouth. If the dog has eaten the toad, however, this is not an option and the prognosis is not good. In most cases, veterinary treatment is in order. A far better option is to have the dog trained to avoid toads and proactively eliminate the possibility of a poisoning event. Have your dog trained before the monsoon season begins!